An aesthetic line sweeping up alongside the massive South Face of Denali, the West Rib is a challenging route for climbers with good technical experience and wishing to push themselves on what definitely qualifies as a “Big Route.” Steeper, more exposed, more committing, and more serious than its neighbor, the West Buttress, the Rib is all about the climbing. 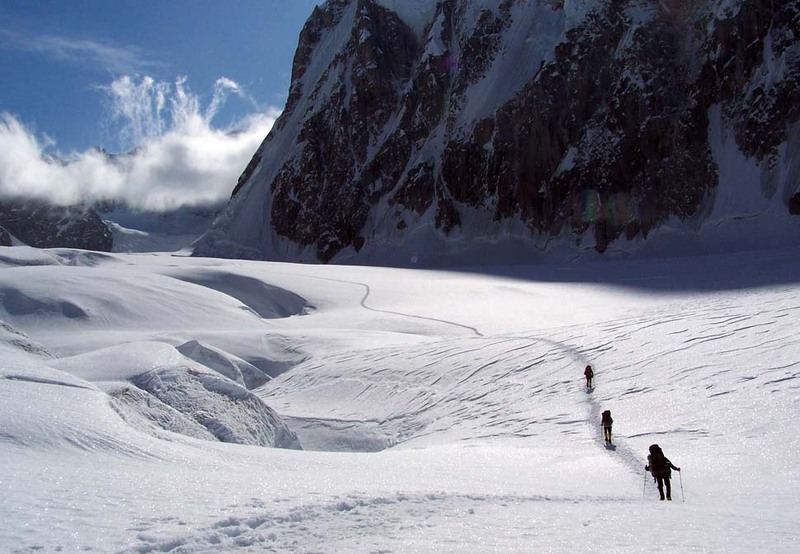 Just getting to the base of the route is a challenge, as climbers need to negotiate complex glacier travel to make it through the Northeast Fork of the Kahiltna Glacier. 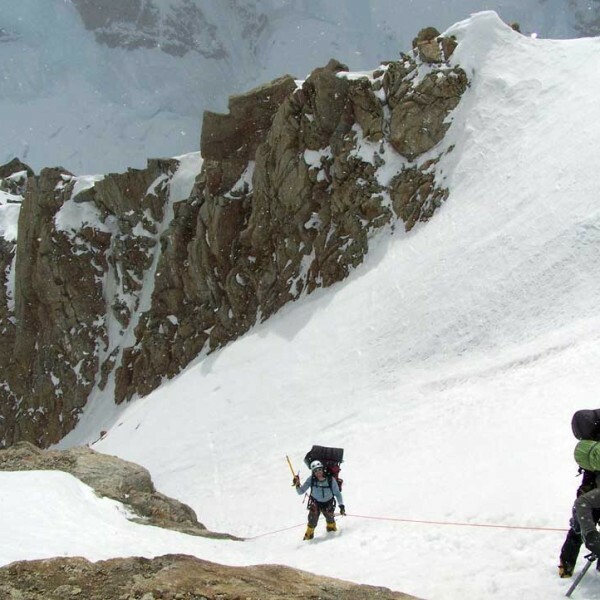 The route itself starts with a challenging 50 – 60 degree snow and ice couloir and remains steep all the way to the plateau known as the Football Field, at over 19,000 feet. We have options for how we attempt this route. With increasing frequency, we have been climbing it in “alpine style,” meaning that teams acclimatize on the West Buttress before dropping back down the the lower Kahiltna Glacier to push up the route. This has the benefit of allowing climbers to spend less time on the route, which is very exposed to storms. There are also some very good reasons to climb the route in traditional expedition style, meaning hiking up to the base and climbing it without acclimatizing on another route. How we decide to climb will be based on conversations with our climbers, as well as how conditions seem immediately before the climb. Since its first ascent in 1959, the West Rib has continued to provide beautiful alpine climbing in a spectacular setting. Its rich history and moderately technical terrain still attract the best climbers as they hone their skills. 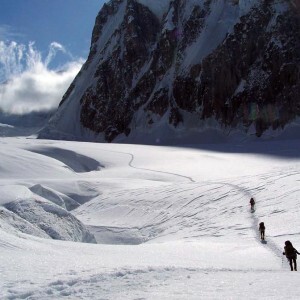 The first winter and first winter solo ascents were made by climbers who guided for Mountain Trip. WE ONLY BOOK THIS TRIP ON A PRIVATE BASIS. Please contact our office for more information. 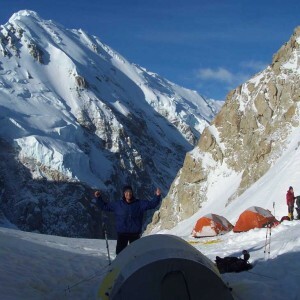 Mountain Trip has been guiding climbers up technical routes on Denali since the early 1980’s. We love this type of climbing! 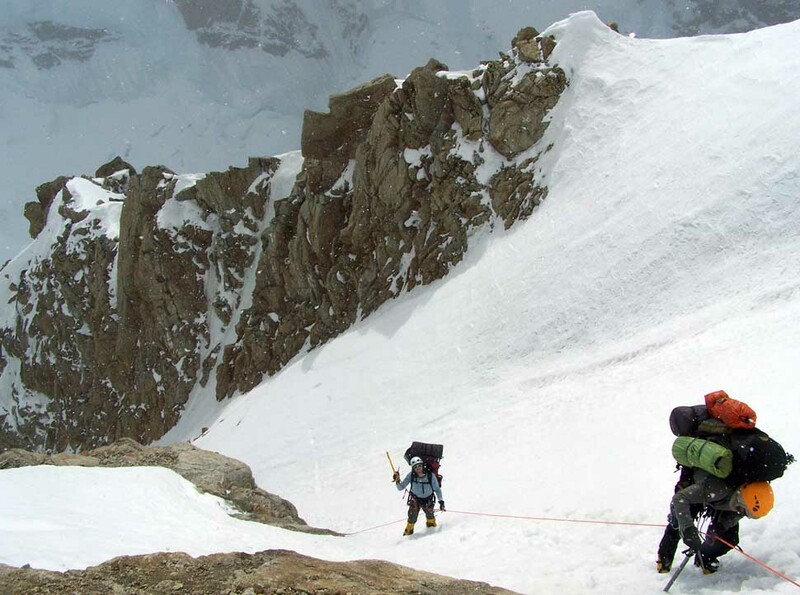 The Rib demands that our guides combine their technical skills with their depth of Denali experience to give committed climbers the best chance of climbing a beautiful line on a huge peak. It doesn’t get much better than that! If you have solid technical climbing skills and are interested in putting them to use on a big, serious climb on a big, serious mountain – give us a call to discuss this option. As we mentioned, there are generally two ways to attempt the Rib. 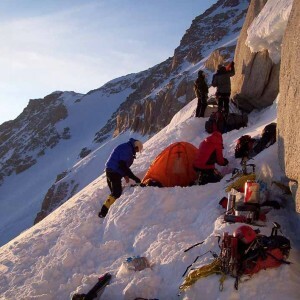 One is to hike out of base camp will all your kit and climb the route expedition style, ferrying loads between camps, while you acclimatize on the route. 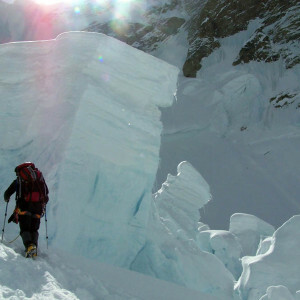 Another style involves ascending the West Buttress route to gain acclimatization and to perhaps put a cache in at the high camp on the Rib. The team then descends back to the North East Fork of the Kahiltna at about 7,800 feet to access the route and climb it in alpine style. As briefly discussed above, there are pros and cons to each method, and conditions of the route may ultimately dictate which style we pursue. The itinerary below reflects an alpine style attempt. Day 1: TEAM MEETING IN ANCHORAGE. Your trip fee includes two nights lodging before the expedition at the Lakefront Anchorage (formerly the Millennium Alaska Hotel), which is very comfortable and conveniently located. We will meet at 10 am on your Team Meeting date for an orientation from the guides and a comprehensive equipment check. If you need to pick up any last minute items, we will provide transportation within Anchorage to do so. Day 2: DRIVE TO TALKEETNA AND FLY TO THE GLACIER. We will pick you up early in the morning for the 2 hour drive to Talkeetna, where we will check in with the NPS and attend their orientation provided to all Denali climbers. After that, we’ll head over to our friends at Talkeetna Air Taxi and finalize our preparations for the flight into Base Camp. Base Camp is located at 7,200′ on the Southeast Fork of the Kahiltna Glacier and weather permitting, we’ll sleep on the glacier this night! Day 3: MOVE TO CAMP 1. Pack up camp and move to Camp 1 at 7,800 ft (2380 m). This is a 5 mile hike with little elevation gain. There can be significant crevasse hazard on the lower glacier, and we might depart in the early hours of morning, well before the sun hits the trail. Day 4: FERRY SUPPLIES TO 10,000′. If we are climbing the route alpine style, we’ll carry supplies and gear to 10,000 ft (3048 m) and then return to sleep at Camp 1. Day 6: BACK CARRY DAY. Back-carry kit from the cache at 10,000 ft and return to sleep at Camp 2. Day 7: CACHE AROUND WINDY CORNER. Carry supplies around Windy Corner at 13,500’ (4551 m) and make a cache at about 13,700′. We’ll drop back down to sleep at Camp 2. Day 8:MOVE TO CAMP 3 ON THE WB. Pack up camp and move up to Camp 3 at 14,200 ft (4328 m). Day 9: BACK CARRY DAY. Back-carry gear from the cache above Windy Corner and sleep at Camp 3 on the Buttress. Day 10: CACHE ON THE WEST RIB ROUTE. 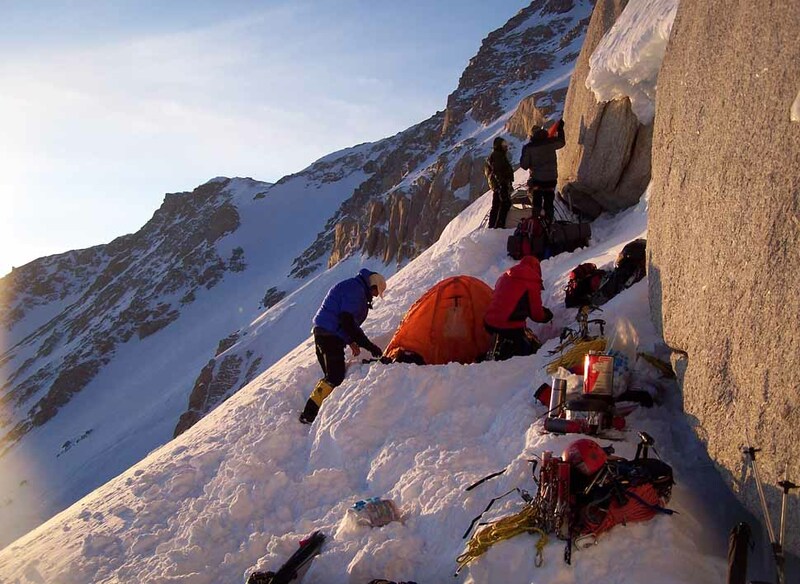 Carry supplies to cache at 16,400 ft (5000 m) on the West Rib and return to Camp 3 to sleep. Day 11: DESCEND TO THE NE FORK OF THE KAHILTNA. Move down to the cache site at 7,800′, at the entrance to the NE Fork of the Kahiltna. Day 12: MOVE TO THE BASE OF THE RIB. Move up the NE Fork to the base of the Chicken Couloir. This is a big, hard day, with route finding challenges. Sections of the route are prone to avalanche hazard, so we need to have good conditions in order to travel, and there could be stretches where we need to keep pushing long after we all would prefer to stop for a break. There are very few appropriate places to camp between the main Kahiltna and the base of the Rib, so we prefer to make this in one long push. Day 13: FIX THE CHICKEN COULOIR. Fix lines up the Chicken Couloir. The terrain here can be ice or snow, depending on the year. Expect to climb up to 60 degrees as we affix ropes to facilitate moving up the couloir the following day. Day 14: MOVE CAMP UP ONTO THE RIB PROPER. Move up to Ice Dome camp. 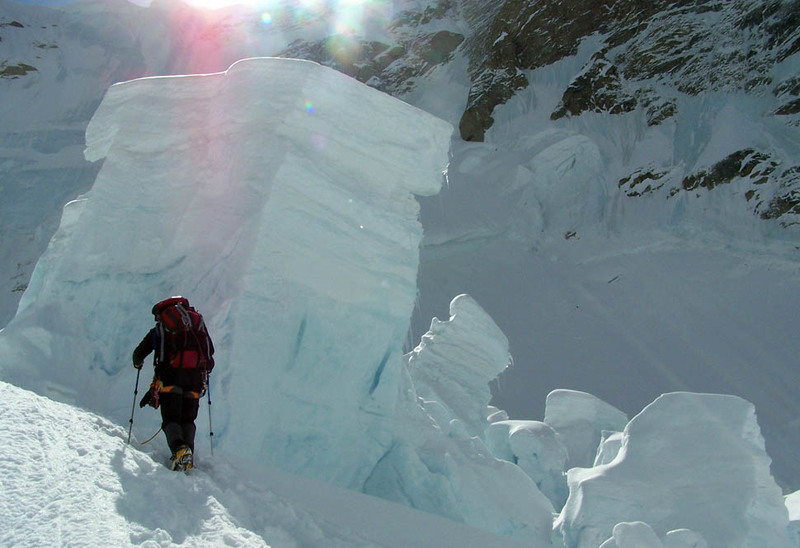 We’ll climb the entire 1,200′ couloir, using a mix of fixed lines, belayed pitches and simul-climbing. This is the “real deal,” with steep ice and snow, exposure and a dramatic setting for some great climbing! Day 15: CLIMB HIGHER UP THE RIB. Continue climbing snow as we make our way up the Rib! Day 17: REST / ACCLIMATIZATION DAY. 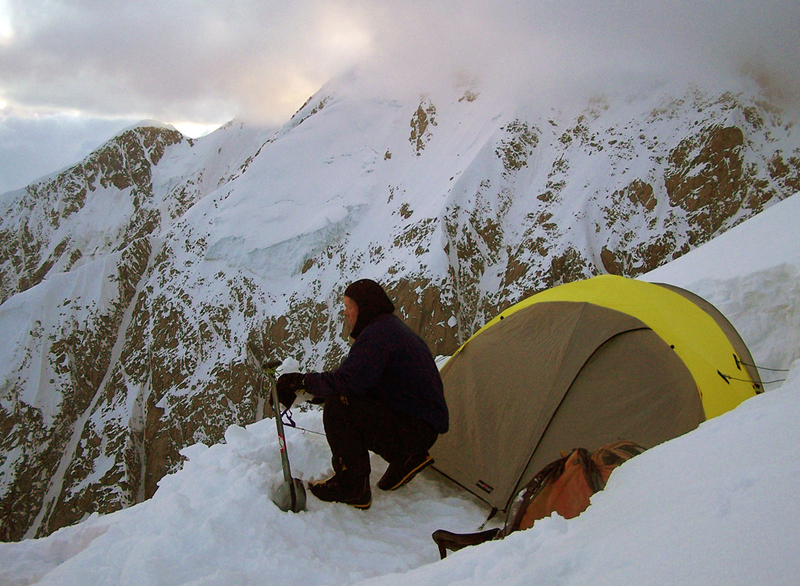 A rest day is generally prudent before launching up the very big and challenging summit day. Day 18: SUMMIT DAY!! Summit day is long, physical, and mentally challenging. The climbing is mostly on show, although we’ll probably climb through a couple of rocky sections as well. The steepest section is the last bit before we top out near the” Football Field,” at about 19,400′. The descent can take as long as the ascent, as we must move deliberately through exposed sections, which can make for somewhat slow going. Plan on 12-20 hours of climbing up and down. Day 19 – 24: CONTINGENCY DAYS for weather etc. The following is a general list of required gear for climbing the West Rib with Mountain Trip. Climbers joining us on an expedition will receive an updated, comprehensive equipment list that may supersede this list. Many of the items on the list need to fit you well in order for you to fully enjoy your experience on the mountain. Please plan ahead with equipment purchased for your trip so you can be certain that your gear fits you well. Perched on a ledge at 15,000 feet on the Rib is not the place to discover that your pack is too small for your torso, or that your boots give you blisters. Recommended items reflect the opinions of our guides. We have used and have faith in all of our recommendations, but they may not necessarily fit or work for you. Technical Ice Axe While a standard mountain axe in a 60-70 cm length will work, you will find that for much of the route, a more technical axe might serve you better, especially when swinging above your head. Technical axes will have a slight bend in the shaft below the head, which helps the pick align with steeper ice at the end of your swing. [post_excerpt] => While a standard mountain axe in a 60-70 cm length will work, you will find that for much of the route, a more technical axe might serve you better, especially when swinging above your head. Technical axes will have a slight bend in the shaft below the head, which helps the pick align with steeper ice at the end of your swing. 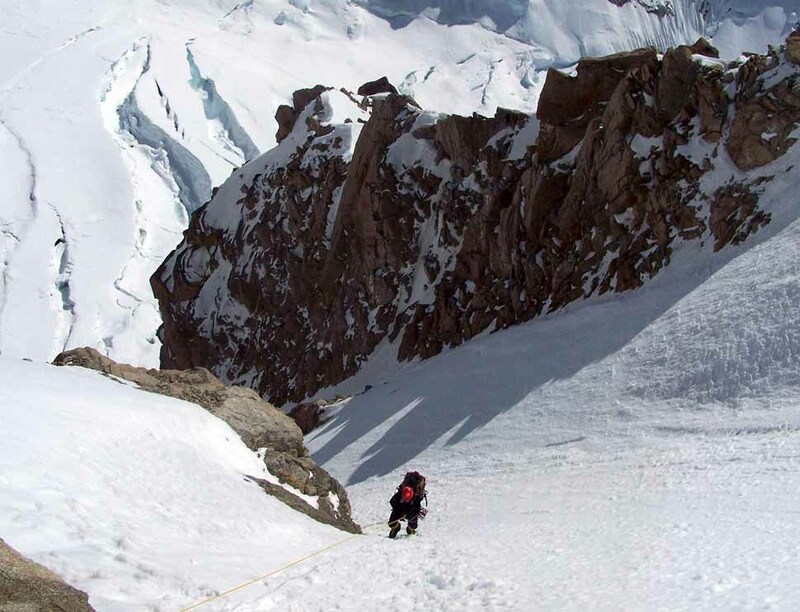 Each year, we advise prospective climbers that Denali might not be a good choice for them at the time after discussing their previous experience and/or level of fitness. We do this because we want each climber who joins us to have a great experience, and it does not serve anyone to bring a climber on an expedition for which he or she is not sufficiently prepared. The West Rib requires an even higher level of screening, as it is a very committing and challenging route. 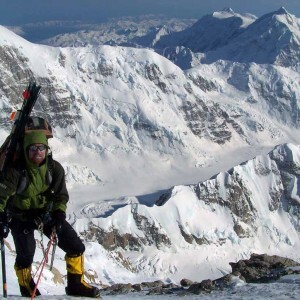 Unfortunately, despite our best efforts to help our climbers choose appropriate trips, we occasionally find climbers who arrive on the Kahiltna Glacier lacking some degree of preparation. 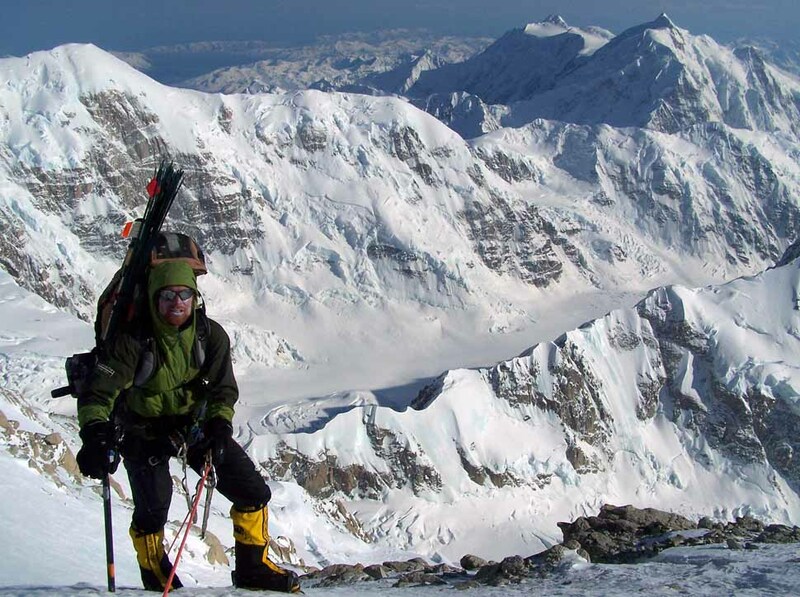 We have opportunities to teach some skills at the lower camps on the mountain and we conduct a variety of skill reviews and help climbers brush up before heading higher on the mountain, because as we get higher on Denali, everything becomes harder and more serious. The vast majority of the time, we can help them or support them sufficiently so that they end up having a great experience in a manner that does not negatively impact other climbers on the team, but this is much less possible on the West Rib. West Rib climbers must arrive with the appropriate level of skills, experience, and fitness. 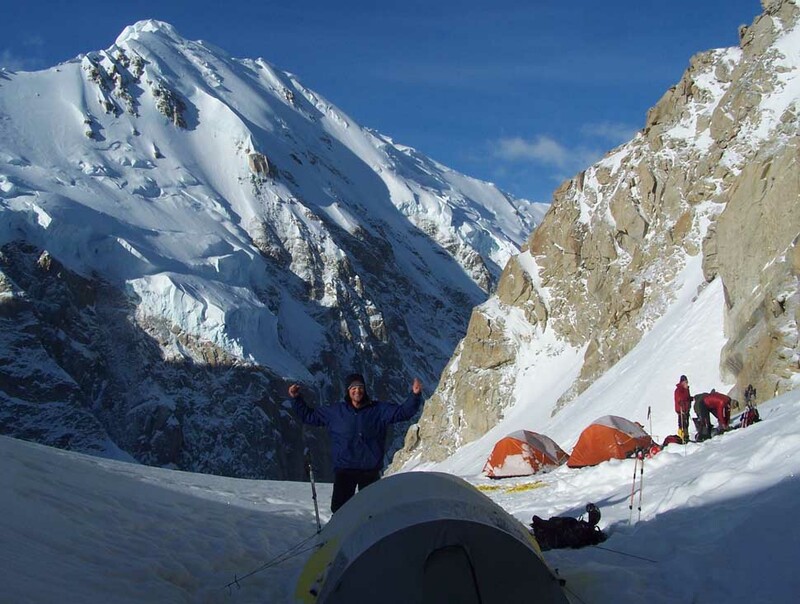 Looking back over the past decade of trip reports and feedback from guides and clients, we see that perhaps 2% of the time, we find that we have someone on a Denali team who cannot, for one reason or another, participate sufficiently to safely climb the mountain. 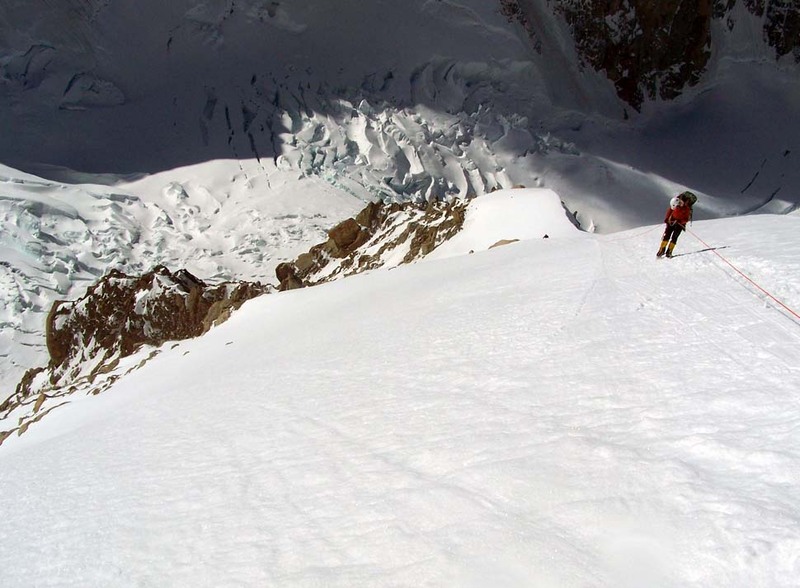 Please note that we use the word “safely” very carefully, because ultimately, climbing a big, cold mountain like Denali is not inherently “safe.” This is much less of an issue on the West Rib, but is something we want to discuss with every climber. As guides, and the administrators of a guide service, we do our best to mitigate risk, but if a team member does not demonstrate sufficient skills, fitness or ability to climb higher, he or she might create an unacceptable risk to the guides and to the team. 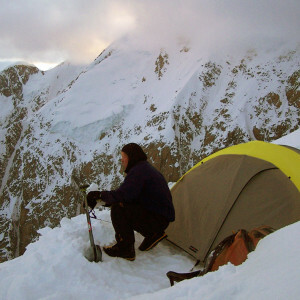 From the 7,800’ Camp to the 11,200’ Camp (if acclimating on the Buttress), it should take about 6-7 hours. 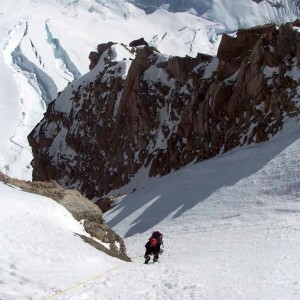 The carry up to 13,700 and back to 11,200’ should take between 6-7 hours round trip, if acclimating on the Buttress. 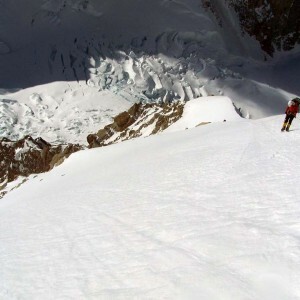 After launching up the Chicken Couloir, it is very difficult to descend, so every team member must have demonstrated that he or she is capable of contributing and climbing the route before moving up the couloir. If a climber decides not to continue up the mountain, or if it is determined that continuing higher is not an appropriate choice, we will do our best to accommodate the climber. Any decisions made at the time will be in the best interest of both the team and the climber. We cannot promise that we can descend at a given point in time or that we will have an option available that will allow you to remain on the mountain as the team climbs higher. Our options will be driven by numerous factors that are present at the time, and we will endeavor to communicate the decision making process with you. We book these trips on a private-only basis. Please contact our office directly at 970.369.1153 for more information and to book. Caroline and I had a great time with the May 16 Denali expedition. I was telling Todd in Anchorage, it started with the informative emails you guys sent us, and continued to the meeting when Todd joined us (and the guides) to lead us through what to expect at our team meeting. Yoshiko, Alan and Brian were exceptional…patient when they needed to be, but not indecisive or lazy with decisions. They were extremely hard working, and made the team feel confident in our abilities. When it was time to work hard they cracked the whip, but also knew when to have fun and join us in our laughter. All in all, I was very happy with Mountain Trip, especially considering we didn’t know what to expect since we registered with another guide service. We would definitely do another trip with you guys…and will tell everyone how happy we were with the service.